In this post, the fifth in a series of posts on how I make screencasts, I’m going to focus on what I call the “whiteboard” screencast. This is a screencast where I am demoing some sort of concept or calculation by writing things down, rather than clicking through a Keynote presentation or typing something on the screen. 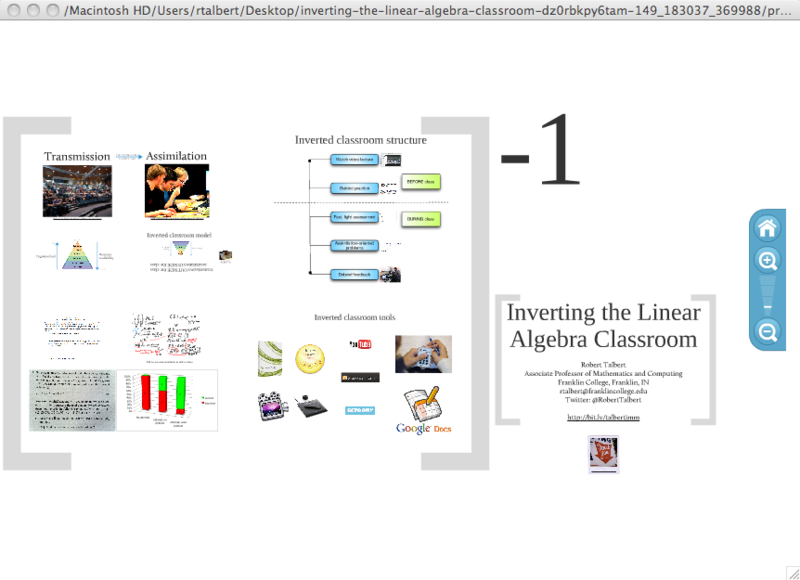 It’s intended to mimic the live presentation of content on a whiteboard, hence my name for it. I do whiteboard screencasts fairly often. I use them sometimes for presenting hand calculations for students to watch and work through before class, and sometimes (probably more frequently) I use them to create additional examples for things I’ve covered in class. This is a really powerful use of screencasts — students often want more examples than there is time for in a class meeting, and whiteboard screencasts give me a way to give students as many examples as they can dream up. So I will start a whiteboard screencast with something like a mind-map of the topic or topics I intend to address and one, maybe two, examples of that topic. Additional topics go into additional screencasts. I work those examples all the way through to ensure that there are no math or other mistakes and that I don’t get stuck in one of my own calculations. If you think about it, this is just the same kind of planning that goes into a successful whiteboard lecture, so this process is not entirely alien to instructors. Keynote; I’ll explain in a minute. Camtasia, which we saw in the last post in this series. 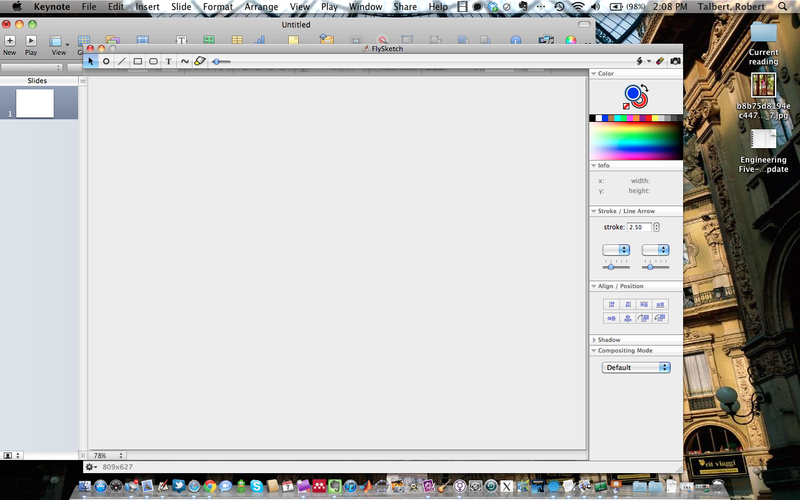 FlySketch, a software app from Flying Meat (they also make the popular personal wiki software VoodooPad). FlySketch puts a transparent overlay on top of any existing objects on your computer screen and allows you to draw freehand, draw geometric shapes, or type text on the overlay. See the link for screenshots and a more detailed description. A Wacom pen tablet. I currently a Wacom Graphire tablet purchased with a grant a few years ago. With my upcoming job change, I have to hand that in when I leave, so I plan on picking up a Bamboo Pen & Touch this fall. With those tools, here is the workflow I follow for making a whiteboard screencast. First, open up Keynote and make a single, blank white slide. This is going to be the “whiteboard” itself. Of course you could also use a blank MS Word document, or any other blank white window or screen. Keynote is just for convenience’s sake. 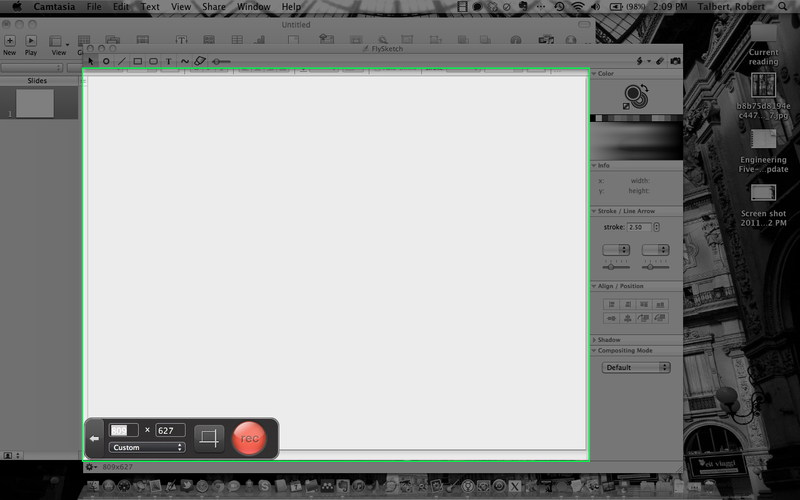 And finally — start the video, and start writing on the FlySketch overlay using the Wacom tablet. Before you start recording, make sure to select the pen color and size you want. If you need to change color, size, or pen type during the screencast — say, you want to switch from freehand writing to typing, or drawing a straight line for an axis — you can tap on the appropriate FlySketch control and Camtasia won’t record it because it’s off-screen. Then you simply record what you need, then stop, and process the video as was described in the previous post in this series. 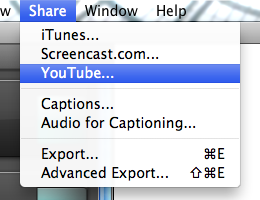 This includes editing out any mistakes and splicing together multiple video clips for the same screencast. Although Sal Khan has been my inspiration for doing screencasts, I’ve made some conscious decisions here to do things differently than Khan does. First, I prefer the white background to the black; it’s more familiar to learners and seems cleaner. I also tend to use thicker pen “tips” than Khan does; I tend to think his pens look a little spidery. Also, the Wacom tablet pen is pressure-sensitive, and that feature works better if the pen tip is thicker. Finally, from a planning perspective, my whiteboard screencasts are a lot less conversational than Khan’s videos. Khan tends to shoot from the hip in terms of presentation; this is part of what makes his videos so charming, but I think it also tends to make his videos go longer than they need to. I prefer to make things a bit more efficient and focused and take less time. It also cuts down on mistakes. I think the hardest part of this process, for me, was mastering the art of writing on the Wacom tablet in one place and having the writing appear on the screen. This is harder than it sounds! At first my handwriting was horrible (I think at the time I likened it to somebody with a brain injury) but eventually I got my act together. I suspect people learning to play the drums or the piano have to go through the same process before it sounds any good. Another challenge is managing the relatively small amount of physical space you are working with. A Keynote slide is just not a very large place, and it’s easy to run out of room when writing. If this happens, it can be dealt with by just starting another slide and creating a new video clip. But it’s better for the learner to see one example per slide if possible, and making sure this happens is part of that all-important planning process. I find it helpful to practice the presentation not on the screen or a piece of paper but on a 3 x 5 inch notecard, which has something much closer the same proportions for writing as the Keynote slide on the screen. But note that it does take practice — if you just sit down and try to bang out a whiteboard screencast, it’s likely not to be as good or as instructional as possible, and it could end up taking more time in terms of edits and re-takes than it would if you just planned and practiced in the first place. I’d be interested in hearing any alternative approaches for making these kinds of screencasts. I once wrote Sal Khan and asked him what his tools were, but never got a response, so I just reverse-engineered what he was doing. There may be a better way. Let me know! Next up will be the final installment in this series, touching on what I called a “demo” screencast. It’s probably what I do the most. Stay tuned! Now that school’s out, I’m going to pick up where I left off (two months ago!) in my series on how I make screencasts. So far I’ve made three posts in this series. In the first post we talked about what a screencast is, exactly, and why anybody would want to make one. In the second post, we saw how the elements of careful planning make screencasting a successful experience. 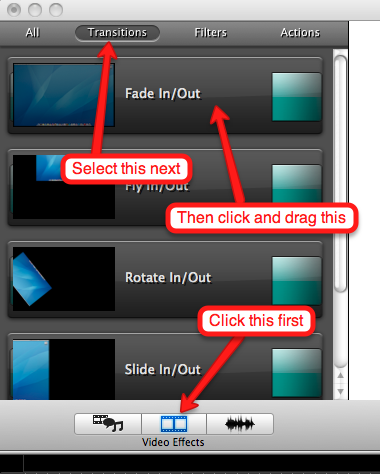 And in the most recent post, we took a look at using Keynote (or PowerPoint) to create a lecture-capture screencast. Before I talk about the other kinds of screencasts I make, I’m going to take this post to describe how I use my go-to tool for screencasting: Camtasia for Mac, specifically how I use it to make lecture capture videos when I’m not using Keynote. (Full disclosure: I was on the beta-testing team for Camtasia for Mac and got a free license for the software for my efforts. But I can definitely say that I’d gladly have paid the $99 for the software otherwise — it’s that useful.) There is a Windows version of Camtasia and a server-oriented variant called Camtasia Relay, and they are all very similar, so what I describe in this post can be used if lots of different situations. Let’s suppose I have a lecture or presentation that I want to turn into a screencast, which basically means I need to record the presentation as it happens on the screen and add a voice-over. I’ve already described how to do this with Keynote or PowerPoint, but what if you’re using Prezi, Beamer, or some other presentation tool? What I need is a tool that will record stuff happening on the screen that’s separate from the presentation tool itself. That’s where Camtasia comes in. Camtasia is software that records video of anything happening on your screen — all of it, or part of it — along with any audio you choose to add, including voiceovers. You can record multiple segments of video, edit those segments, and put it all together with transitions and effects. The interface is laid out a lot like iMovie, so Mac users will feel right at home using it. 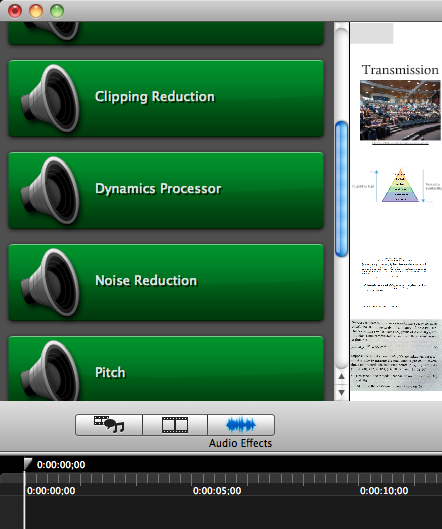 There are a lot — seriously, a lot — of options for working with video in Camtasia, too many to get into here. 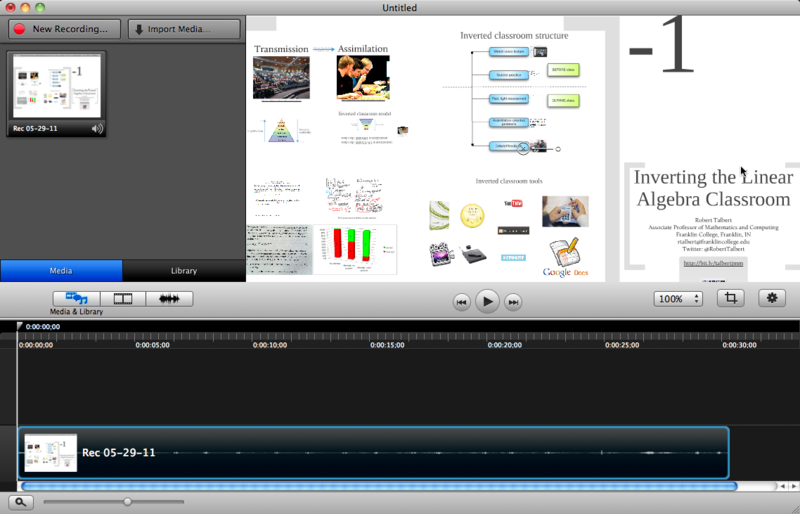 I’ll just show an example of a simple lecture capture putting Prezi and Camtasia together. The dropdown menu on the left lets you specify which part of the screen you’re going to capture. I usually just select “YouTube HD/720p”, which records essentially the entire screen. I can crop out what I don’t need later. And once I put it on YouTube (which is my usual destination for screencasts) it’ll be in glorious 720p HD. Once you’ve selected your area, just click the Record button and start presenting, just as you would if you were giving the lecture in front of a live audience. Your lecture is being recorded behind the scenes and all you see is your screen. Warning: Presenting for a screencast feels a lot different than doing it for a live audience because, well, the audience isn’t there. There’s no body language or ambience to add to the presentation. So this will feel a little unusual at first. Also, I can’t stress enough that you should probably go from a prepared script the first few times you do this, rather than try to wing it. It’ll keep you on track and prevent lots of mistakes. The bottom part of this screen is called the “timeline”. Right now, the one clip that I have in the timeline is a partial video of the presentation. It appears as a chunk of the timeline outlined in blue. Inside the timeline you can see the audio levels given as waveforms, and there’s a playhead along the top of the timeline showing you where you are in the video as well as the time. You apply the clip just by dragging it from the effects area directly onto the clip in the timeline. In fact this is how all the effects, transitions, and other features of Camtasia are applied to video. The Dynamics Processor brings all audio levels up to a uniformly audible setting. 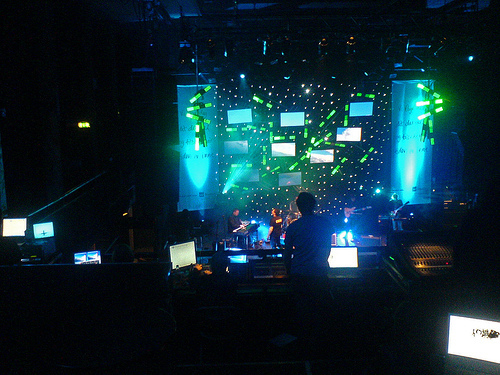 Then selecting “Split selected at playhead” from the Edit menu; this splits the video clip in two, right where the blooper is. Then move the playhead until just after the mistake, and selecting “Trim Start to Playhead”. This will crop out the blooper from the second clip. Then you can just drag the second clip over next to the first one, and with that, the blooper is edited out. 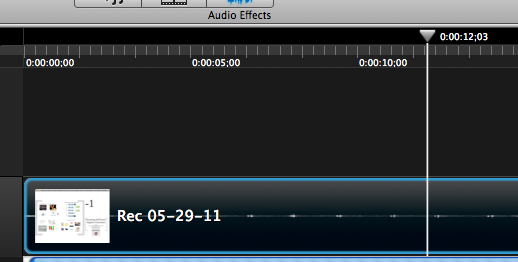 The ability to edit in such an easy way really changed screencasting for me. You will make mistakes when you screencast, no matter how good or experienced you get. But you don’t want to have to throw away an entire screencast because of one goof. If I am screencasting and I make a mistake, I just pause for a moment, and then I start again from the point of error. The pause will show up on the audio as a flat spot, and I can go back and edit the error out. You cannot do this with the voiceover features of Keynote and PowerPoint, and it makes a huge difference. As you can see, there are options for iTunes and Screencast.com as well. Or you can just choose “Export…” which exports the video to a file format of your choice, for uploading wherever you want. After I start the process, Camtasia converts the video to Quicktime and then uploads it with the title I gave it. A 10-minute video will take several minutes to complete this process on a Macbook Pro. Your mileage will vary according to your system hardware and your internet connection. After it’s done uploading, I still have to go to YouTube and add metadata. But otherwise that’s it! 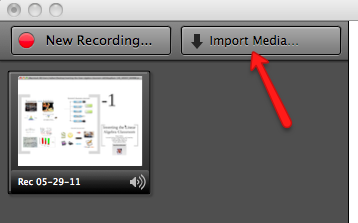 What’s nice about Camtasia is that the tool is separate from the presentation tool you’re using. 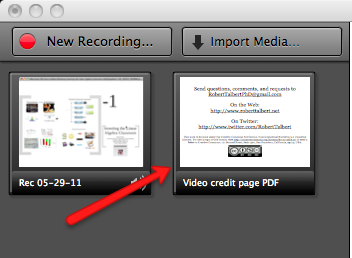 So if you already have the presentation content made up, you can turn it into a screencast quite easily. It doesn’t matter whether it’s Prezi, Beamer, a text document you’re scrolling down, or anything else. And the more you do this, the easier it gets to convert existing presentation content into a mobile device-friendly screencast. In the next post, I’ll talk about what I call “whiteboard” screencasts, where I record stuff that I am writing on the screen. This is a lot like what Salman Khan at Khan Academy does. Hopefully it won’t be another two months before I get to that. Since I started to put serious amounts of time and effort into screencasting last summer, I’ve gotten a lot of requests to blog about how I go about making these things. Starting with this post, I’m going to do a multi-part series here about making screencasts — or at least how I make screencasts, which is a long way from perfect or canonical, but it’s what people asked for! I hope it’s useful for people who are interested in this kind of thing and need some pointers; and I hope too that those with more experience and better ideas than I have can share. First, let’s start with a few FAQ’s. Q: What is a screencast? A: A screencast is a video of stuff that is happening on your computer screen. There is often, but not always, some kind of voiceover happening in the background as well. So a screencast can be a lot of different things: A recorded Prezi or PowerPoint slide presentation; a demo of computer software; a “whiteboard” lecture with audio capture; a video of you playing Angry Birds; or any linear combination of these. Q: What’s the point of a screencast? A: I suppose you could do just about anything with a screencast, but mainly the point is to instruct. Some people make short screencasts to show a remote collaborator or student how to do some little task on their computer, like this one I made on the fly in Linear Algebra class last Thursday morning to show students how to get MATLAB to produce code. Or you can record partial or entire lectures (like many of the ones I did for my department’s YouTube channel) for students to watch outside of class. Or you can record lengthy demos of software usage like I have done in my ongoing series of MATLAB screencasts. Or you can record every level of Angry Birds you play. Suit yourself. The screencast is just a means of conveying some process or stream of information that can be represented on the screen and therefore captured using software and disseminated on the web. It’s a pretty much wide-open medium. Q: So what kinds of software and hardware and other stuff do you use? Demo screencasts, where I am doing a straight-up screen capture of something happening on my computer (as opposed to a presentation or “whiteboard” work) in real time. Each of these kinds of screencasts requires a different set of software and hardware tools, as well as a different set of approaches for actually making them. So I’m going to spend at least one post on each. Actually, most of my screencasts are really combinations of these; for example a lot of the MATLAB screencasts start and end with a lecture capture and have MATLAB demos in the middle. 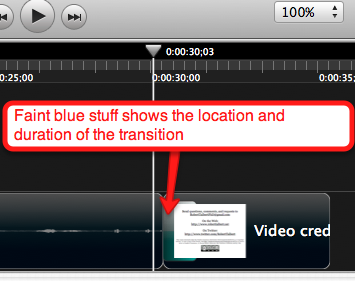 In the next post, I’ll start things off by focusing on lecture capture screencasts and how I work with those. They’re probably the simplest of the three kinds I make. Do you have any specific question or topic you’d like me to address as part of this series? This article first appeared earlier this week on the group blog Education Debate at OnlineSchools.org. I’m one of the guest bloggers over there now and will be contributing articles 1–2 times a month. I’ll be cross-posting those articles a couple of days after they appear. You’d enjoy going to Education Debate for a lively and diverse group of bloggers covering all kinds of educational issues. It used to be that in order to educate more than a handful of people at the same time, schools had to herd them into large lecture halls and utilize the skills of lecturers to transmit information to them. Education and school became synonymous in this way. Lectures, syllabi, assessments, and other instruments of education were the tightly-held property of the universities. But that’s changing. Thanks to advancements in media and internet technology over the past decade, it is simpler than ever today to package and publish the raw informational content of a course to the internet, making the Web in effect a lecture hall for the world. We now have projects such as MIT OpenCourseWare, Khan Academy, and countless initiatives for online education at US colleges and universities providing high-quality materials online, for free, to whomever wants them. It brings up a sometimes-disturbing question among educators: If students can get all this stuff online for free, what are classrooms and instructors for? 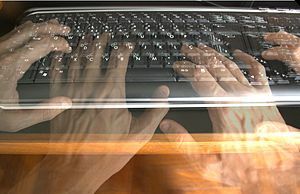 Tech author Randall Stross attempts to examine this question in his New York Times article “Online Courses, Still Lacking that Third Dimension”. In the article, Stross mentions “hybrid” courses — courses with both online and in-person components — but focuses mainly on self-contained courses done entirely online with no live human interaction. He correctly points out that learning is an inherently human activity, and technologically-enhanced coursework is successful insofar as it retains that “human touch”. However, Stross casts the relationship between computer-enabled courses and traditional courses as a kind of zero-sum game, wherein an increased computer presence results in a decreased human presence. He refers to universities “adopting the technology that renders human instructors obsolete.” But it’s not the technology itself that makes instructors obsolete; it’s the adoption of practices of using that technology that does. There are numerous instances of traditional college courses using computing and internet tools to affect positive change in the learning culture of the institution. There are also plenty of cases, as Stross points out, where technology has replaced human instructors. The difference is an administrative one, not a technological one. Nor is the supposed obsolescence of the instructor all technology’s fault. If universities and individual professors continue to hold on to a conception of “teaching” that equates to “mass communication” — using the classroom only to lecture and transmit information and nothing else — then both university and instructor are obsolete already, no technology necessary. They are obsolete because the college graduate of the 21st century does not need more information in his or her head to solve the problems that will press upon them in the next five or ten years. Instead, they need creativity, problem-solving experience, and high-order cognitive processing skills. A college experience based on sitting through lectures and working homework does not deliver on this point. The college classroom cannot, any longer, be about lecturing if it is to remain relevant. And notice that an entirely self-contained online course can be as “traditional” as the driest traditional lecture course attended in person if it’s only a YouTube playlist of lectures. What matters regarding the effectiveness of a course isn’t the technology that is or is not being used. Instead it’s the assumptions about teaching and learning held by the colleges and instructors that matter, and their choices in translating those assumptions to an actual class that students pay for. Livemocha is a website that combines quality multimedia content with social networking to help people learn languages. Users can watch and listen to language content that would normally find its place in a classroom lecture and then interact with native speakers from around the world to get feedback on their performance. Socrait, a system proposed by Maria Andersen, would provide personalized Socratic questions keyed to specific content areas by way of a “Learn This” button appended to existing web content, much like the “Like This” button for sharing content on Facebook. Clicking the button would bring the user to an interface to help the user learn the content, and the system contains social components such as identifying friends who also chose to learn the topic. I would offer my own experiments with the inverted classroom model of instruction as an imperfect but promising example as well. Research suggests this model can provide in significant gains in student learning versus the traditional approach to teaching by simply switching the contexts of lecture and activity, with lecture being delivered via video podcasts accessed outside of class and class time spent on problem-based learning activities in teams. Rather than view college course structure as a pie divided into a computer piece and a human piece, and fret about the human piece becoming too small, let’s examine ways to use computers to enhance human learning. If we keep thinking of computers as a threat rather than an aid to human interaction, computer-assisted instruction will continue to lack the human touch, the human touch will continue to lack the power and resources of computers and the internet, and student learning will suffer. But if we get creative, the college learning experience could be in for a renaissance. I think the students have a point here. Prof. Quinn did say that he “writes” the exam questions. This doesn’t necessarily mean that he creates the exam questions from scratch; “writing” an exam could refer to the act of assembling a particular mix of questions from the test bank. But it’s unrealistic to expect the average college student to know the difference between creating and assembling an exam when the word “write” is used in this context; and anyway he said he writes the questions not the exams. This entire video goes back to a point that involution made in the comments to my first post on this story: Did the students know that the exam was going to come from the publisher’s test bank, or was there at least a significant chance that it would be? If not — if the students had no reason to believe that the test bank should be off limits — then what the students did can’t be called “cheating”. How could it? Cheating is when you use an unauthorized resource to substitute for your own knowledge. If the resource isn’t unauthorized, it’s just another resource, not a cheat-sheet. If Prof. Quinn didn’t make it clear that the test bank was off-limits, I’m afraid he doesn’t have much of a case here after all. What exactly was said in the class or the syllabus about and test banks? Does anybody know? Of course, by telling the students that the test bank is off-limits, you are basically telling students that the exam comes straight from the test bank and therefore making it that much more likely that this sort of cheating will take place. But I consider that a strong reason not to use test banks at all, rather than a reason to keep the test bank under wraps. In fact, the more this situation unfolds, the more unhealthy it makes the whole educational environment surrounding it seem. Class sizes in the multiple hundreds: Check. Courses taught mainly through lecture: Check. Professor at a remove from the students: Check. Exams taken off the rack rather than tuned to the specific student population: Check. And on it goes. I know this is how it works at many large universities and there’s little that one can do to change things; but with all due respect to my colleagues at such places, I just can’t see what students find appealing about these places, and I wonder if students at UCF are thinking the same thing nowadays. …is absurd. Right now the students, rather than sounding like mature young men and women who have been legitimately put on the wrong side of an issue in an unfair way, sound like whiny undergraduates asking for class to be cancelled and wanting more points. If you have a point, make it — respectfully and logically. You might also try not making spelling errors such as “frustated”. I’m assuming the students want to succeed in the business world, and this is how it works as far as I understand it. What a sad situation. Why don’t they just make up their own tests at UCF? That’s a quick screen capture from a commercial that started running on various websites this month (I stumbled across it on ESPN.com). There is apparently a 30-second version on Hulu. Readers of this blog need no explanation as to why this is worth a boycott of Pizza Hut. It’s not really a big deal. But, rather, it’s yet another small step that a high-profile person or organization has taken towards making math, and by extension all the STEM disciplines, less likely to be taken seriously by the general public and in particular young people. And it’s another little paper cut for anti-intellectualism in general that will eventually bleed us all to death. Big companies have no business making themselves part of the problem, and every opportunity to become part of the solution. Therefore I am asking anybody who feels like I do about this commercial to boycott Pizza Hut until they (1) pull the advertisement, (2) apologize, and (3) donate a modest but substantial sum of money — say the approximate revenue they gained from running this ad — to a nonprofit organization that supports STEM education. In particular, if you are a teacher, share this post with your colleagues and administrators and encourage a school-wide boycott of Pizza Hut for school parties, trips, etc. I’ve been beating this to death in my Twitter stream, and I’ve set up a Facebook group for people to rally around. The YouTube video has gotten upwards of 8000 views and over 50 comments since I posted it this past Sunday, so I think there is a lot of common cause happening here. Go to it! UPDATE: Pizza Hut responded while I was typing this post. Check the wall of the Facebook group. It’s a start.